Fall River Village now adds rustic modern charm to Estes Park, almost ten years after its inception. The resort survived recession, foreclosure, bankruptcy, abandonment and flood damage. Today, its revived and is exceeding guest expectations for Estes Park rentals. Travelers seeking comforts of home, modern amenities, soothing river sounds and breath-taking mountain views can look no further. Fall River Village vacation condos and town homes offer this niche appeal. 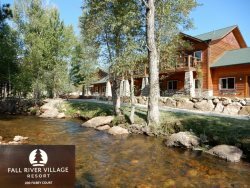 The resort is conveniently located along the banks of the Fall River, near the heart of Estes Park. It’s a short walk from downtown shopping and restaurants, yet just a 4-mile drive from the entrance of Rocky Mountain National Park. The property boasts 60 new two bedroom two bathroom units. All these Estes Park rentals have a fully-equipped kitchen, gas fireplace, washer/dryer, deck or patio, and a gigabyte of free fiber optic Internet. The resort’s amenities include a large in-ground heated pool, hot tub, gas and natural fire pit areas, picnic and BBQ areas, and outdoor and indoor games areas. Currently, Fall River Village is in a phase of expansion. Our one bedroom “Crow’s Nest” and four bedroom “Cliff House” town home housed their first guests this summer, offering views of the Continental Divide and Longs Peak. Three bedroom town home options will also become available in 2017. Fall River Village is a property of Metropia, LLC, a Broomfield-based real estate re-development, investment, and management company specializing in the acquisition, value-recovery, and value-add of distressed, under-valued, and under-performing commercial multifamily properties. The company is inspired by the process of reclaiming, reviving, and renewing these underutilized properties and the impact transformation has on the lives of their residents, the surrounding neighborhood, and the community. Through experience and the expertise of their principals, partners, and affiliates, they have developed successful methods of identifying the most viable of these opportunities in the best markets, and created proven systems to rapidly and efficiently mitigate the issues that plague their performance. Once an acquired property is stabilized, Metropia then adds value through cosmetic re-design, professional marketing and branding, energy efficiency initiatives, effective use of technology, good business practices, and strong management.